I was provided with media credentials to attend the Albuquerque International Balloon Fiesta, which is a breath-taking and awe-inspiring event. All opinions are my own. Just gonna warn you now…. when you go to the most widely photographed event in the world and your son loves to take pictures, you leave with about 2,000-ish photos. Which means…there’s a TON of pictures to follow! Our Mother-Son Road Trip got off to a good (yet not what we planned) start. We spent the second day driving from Amarillo to Albuquerque. We saw plenty of beautiful scenery on our 4-ish hour drive and arrived in time to relax a little before our first media event. that evening. The first “Mass Ascension” was to take place the next morning, kicking off the Fiesta. We were told it’s best to arrive NO LATER than 4:30 A M, even though it doesn’t start until sunrise, around 7:00. I don’t know if you’re aware, but 4:30 is EARLY! I will admit, I was a little skeptical about needing to get there so early …but it’s true. There was already a line of traffic to get into the Park and it was only getting longer. In the end, I was glad we had chosen to listen. We really did not know what to expect. Honestly, I’d never heard of the Albuquerque International Balloon Fiesta, so I had no idea we were attending the largest balloon festival in the world! We met another media rep and his family that first morning as we ate breakfast and waited for the activities to begin. His parents are originally from Albuquerque and have lived there for years, even witnessing the first fiesta ascension back in 1972, as the balloons flew over their backyard. They were a wealth of knowledge! The Balloon Fiesta was started by Sid Cutter with only 13 balloons, back in 1972. Today, it’s grown to over 500 participating balloonist from all over the world with hundreds of thousands of spectators attending each year. It is said to be the most widely photographed event in the world! After having attended, I can see why… remember I mentioned we have over 2,000 photos from this trip. It’s breath-taking to see hundreds of balloons ascend in waves and fill the sky as the sun rises over the Sandia mountains. It’s really almost indescribable….hence the photographs. You know what they say….A picture really is worth a thousand words. So, without further adieu, I give you…..
Just before dawn, a few select balloonist take off in the dark. They are testing the wind but it also provides a beautiful display of the balloons as their burners illuminate the patterns against the dark sky. One of the things I loved most about the Fiesta was the balloonist! They are so friendly. They welcome the crowd onto the field. People stand around near the balloons as they take off. You feel like you are a part of the festival, not just a spectator. You can even be a part of one of the Mass Ascensions! Balloon Rides are offered by Rainbow Ryders. I’ll share more about our balloon ride later. Darth Vader and Yoda – because my son has seen Star Wars at least 100 times! Dr Pepper….’cuz we’re from Texas, y’all! Because, who doesn’t love a carousel? Because I’m a girl…and I love hearts! Where do all those balloons go? Well, there’s no way to steer a balloon, they are at the mercy of the wind. So, when they take off, everyone heads the same directions and they try to land before they get to the airport. Air traffic controllers are funny about balloons being in the flight pattern. But there’s always that ONE guy…. 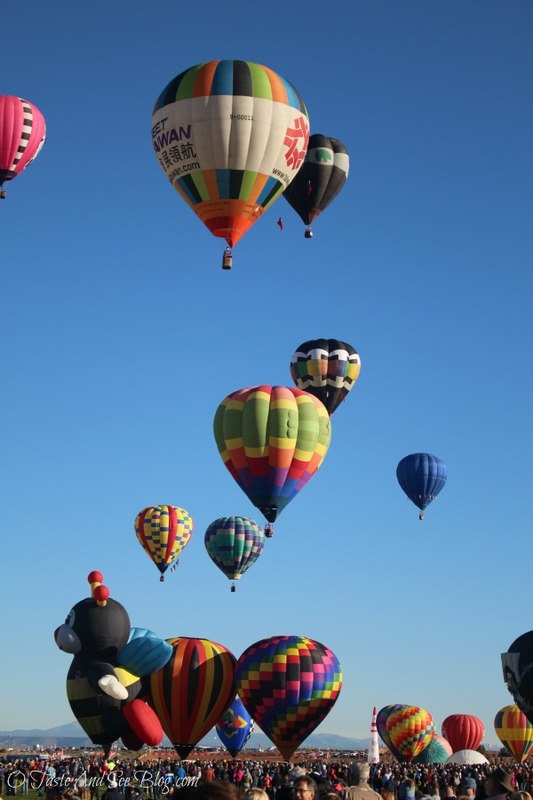 The Balloon Fiesta is always the first FULL week of October. Hotels fill up quickly, so start making your plans now to attend next year…I know my son is. I love how you described the different waves of the ascension, it was truly amazing to see. Aiden looks perfectly natural on the Sid Cutter statue! I can’t wait to read the post about your actual flight, that is something that we did not get to do – next year! Yes, the balloon ride is one thing I highly recommend. Y’all would LOVE it! AND the photo opps! Aiden took all the photos from our balloon ride and did a great job.